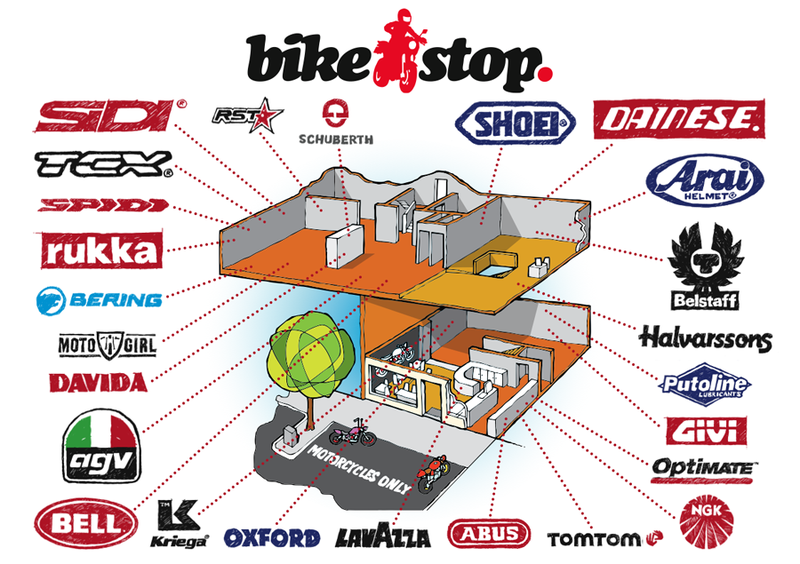 Did you see Dougie Lampkin do this round our store? Take a virtual tour of our showroom - click and drag above! Our showroom is conveniently located just by the A1(M) off junction 7 or 8 in the delightful ‘Old Town’ Stevenage (30 miles north of central London). It occupies two adjacent Grade II listed buildings and is often described as a "TARDIS" – with 8 different ‘kit’ rooms spread over 3,000 square feet of space on two floors. So come visit for personalised expert advice, to try on that jacket, helmet, suit or boots you’ve set your heart on, while also catching up with the team, fellow bikers, and taking a well earned break! But it is not just a shop, it’s also a destination with dedicated customer parking, seating and tables inside and out as well as Lavazza whole bean coffee, cakes and paninis. It's also where we hold our many special events throughout the year, with celebrities, special bikes on show, and even ‘Ride-Outs’.